They were trouble-free times when oil barons were dining out with rich sheikhs and counting their profits. But little did they know their drilling exploits would come back to haunt them. Up to four would-be tycoons can compete at exploring for oil, building platforms and laying pipelines to their home countries. Unhappily for BP, that is just one per cent of the amount it has spent each day tackling the very real Deepwater Horizon leak, which has seen millions of barrels of oil gush into the Gulf of Mexico and hit the southern US coast. The mint-condition game, made by Scottish company Printabox, was donated by a private collector to The House On The Hill Toy Museum in Stansted, Essex. It was very rare and ‘obscure’, said museum owner Alan Goldsmith, who added: ‘The parallels between the game and the current crisis... are so spooky. 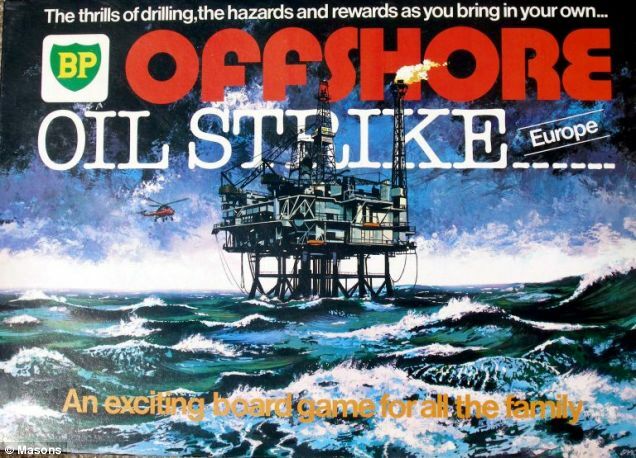 ‘The picture on the front of the box is so reminiscent of the disaster, with the stormy seas, the oil rig and an overall sense of doom. I was just knocked over by how relevant this game is, despite being made some 35 years ago, to BP’s troubles today. ‘It’s amazing when you think that their own game predicted this big oil slick – although, sadly, not the extent of the cost involved.’ The game was worth only about £75, he said, adding it was not popular at the time of its release. "Wayne Harris, chairman of the Okaloosa County, Fla., board of commissioners, was ready to go to jail. The county’s engineers had a plan to protect a crucial inland bay from oil, but had spent days waiting for the green light. The plan included several floating barges, a submerged oil-catching curtain, and a wall of air projected from an underwater pipe. State and federal authorities had so far not accepted or rejected the idea, which could cost more than $2 million in the first month. And under federal law, BP and the Coast Guard would have to approve the plan. Florida officials are used to protecting their own. Now, as the oil spill continues through its third month, county officials are straining against the federal rules for an oil-spill response. Since April 20 the oil spewing from deep beneath the Gulf of Mexico has proven taxing for BP and federal authorities in charge of controlling it. To describe what the federal response is lacking, county officials use a phrase familiar to military types: command and control. In other words, everybody needs to know who’s in charge, and the people in charge need to know what everyone else is doing. Instead of walking a steady path, BP and federal officials (known as the Unified Command) have conjured some aspects of response to the current spill from scratch and changed them daily, trying but often failing to act with the speed and decisiveness an emergency demands. The problem is the fact that Unified Command is the only authority. When a hurricane hits Florida, county-level officials can move resources if they see worse damage on one side of town. But with BP and the Coast Guard controlling the oil-spill response, a county-level official can’t make a decision without making a phone call and waiting for several other layers of command to approve it. Want to move a boom from one side of Pensacola Pass to the other? Until recently, the procedure looked like this: ring the state’s emergency operations center, who will call Unified Command in Mobile, Ala., who may or may not call top officials in New Orleans—all while folks in Florida wait for a return call. Even that tiered system might be fine except that Unified Command has at times not responded to requests—like Okaloosa County’s multilayered plan to keep oil out of Choctawhatchee Bay—for days or weeks. “We’ve learned not to let anybody else carry the ball for us, because [it] usually doesn’t get carried,” says Grover Robinson, chairman of the county commission in Escambia County, Florida, which has spent nearly $10 million responding to the spill." "The Obama administration lost its court bid to maintain a six-month moratorium on offshore deepwater drilling which a federal judge ordered lifted last month. The Fifth Circuit Court of Appeals denied the government's emergency request to stay that judge's order pending appeal. The motion was denied because the government failed to show "a likelihood of irreparable injury if the stay is not granted," the appeals panel judges wrote in a 2-1 ruling. Interior Secretary Ken Salazar has said he will soon issue a new order to block deepwater drilling regardless of how the court ruled and oil companies have not resumed drilling due to the legal uncertainties." is Obama really interested in capping this leak or does he like to keep it going as a propaganda tool against oil companies? "(July 9) -- A Russian captain says his country has the vessels that could cap the oil leak in the Gulf of Mexico but is very surprised no one has asked Russia to help. "Our subs are unique," Yevgenii Chernyaev told a BBC science correspondent. "There are two of them, and they can submerge and work simultaneously. Also, they are powerful enough to work with any other additional equipment." But he said such an operation would work only if the Obama administration invited the Russians to try to stop the leak. "It should all be decided on the government level," he said. Chernyaev conceded that the Russians would need to work with other international specialists to make an impact. "We would not refuse to help, even though for us it would be very complicated." He added, "But it doesn't look like anyone seriously wants our help." A request for comment to the U.S. Coast Guard was not immediately answered." How come BP or any of the other big oil companies didn't have their oil spill clean up research departments determine if this Russian's ideas effectively clean oil from water before this spill occurred?? I'll tell you why, they would have had to spend money to do the research and that might have cut into their record profits. The oil companies don't like that! They'd rather keep the profits and let "the small people" endure consequences of the risk they take. "A BP spokesman said that 9,200 people have submitted ideas on how to fix the leak in the gulf. About 2,500 of those were submitted for expert review with 700 of those having already been reviewed. About half of those are being implemented by workers in the gulf." If BP and the other oil giants had spent a sufficient fraction of their outrageous profits to research ways to remove oil from water before this massive Deepwater Horizon oil spill occurred, they'd already know which of these 9,200 and counting suggestions can safely do the job. But no, big oil spent almost none of their profits to research cleaning up oil spills so we could actually be ready to save Gulf walruses (< eye roll >) from the first barrels of oil to spill into Gulf waters. But instead, because of oil companies' failure to fund the research to clean up oil spills, we sit here today waiting for experts to quickly determine which of the thousands of suggestions are the effective ways to remove the oil that has been spilling into the Gulf waters for months. We can't count on big business to protect anything but their profits. Business must to be regulated to protect us and our environment from their worst failures. Bea's last statement is essentially correct but supefluous. Yes, businesses act with a profit motive and regulations need to set rules for public safety to make sure the most irresponsible aren't the most profitable. Having said that, it's also true that regulations are in place. Problem is, Barry Obama apparently contracted with the Keystone Cops recruiting agency to fill his regulating team. This catastrophe has revealed to the American people how incompetent and unprepared Obama was to become President. When a hurricane sweeps all this oil over the levees in New Orleans and a downed power line ignites it, we'll be able to compare Bush and Obama clearly. Based on his handling of this crisis so far, the people of the Big Easy should worry. Comparing the approval ratings of Bush and Obama at this point in their presidencies show the American people are paying attention. Bush had a crisis in 9/11 and rose to the occassion. Obama had a crisis in the Gulf and sunk in the deep water. Correction Anon. What this catastrophe has revealed is the stranglehold big oil has on our legislators who have NEVER expressed concern until now that big oil gulf clean up plans have long been nothing more than boiler plate BS that talk about saving the gulf's non-existant walruses. How many of the long approved oil industry oil spill containing remedies have worked so far in this case? Any attempt by the company to sidestep that responsibility should be met with the strongest legal recourses available. However, in an administration that appears not to respect fundamental American principles, it is important to note that there is no legal authority for the President to compel a private company to set up or contribute to an escrow account. “BP’s reported willingness to go along with the White House’s new fund suggests that the Obama Administration is hard at work exerting its brand of Chicago-style shakedown politics. That group of GOBPers said that asking BP to pay for the mess they've made was a "shakedown." I think most Americans disagree with them and agree with Obama that BP should pay until every drop of oil spilled has been removed from our shores. Second, Senator Joe Barton has now apologized for his apology to BP, in which he also had said the escrow account to clean up BP's mess represented a Chicago type shakedown. I think most Americans were shocked and ashamed of Barton's publicly issued apology to BP. How stupid is he that a day later he had to apologize for his apology?? Third, apparently tea bagger turned GOP darling Sharron Angle thought the trust fund was a "slush fund" until her big time GOP handlers forced her to once again eat crow. I wonder if she'll send me a cease and desist letter to force me to stop reporting what her campaign has said like she's sent to Harry Reid for reposting her now taken down primary campaign rants. And finally, GOP Mississippi Governor Hayley Barbour originally claimed several times that the spill "isn't anything like Exxon Valdez." (He was right, it's much worse.) He has appeared on television and gone out of his way to praise both BP and the government's efforts: "BP has never said no to any request," he told CNN, while "the federal government, whether it's the Coast Guard or whomever, has worked hard with us." And he has compared washed up oil to "caramel-colored mousse" and "toothpaste." Barbour has repeatedly blasted the media for hurting his state's tourism with reports that make the spill sound "like this is Armageddon." We all agree this catastrophe was caused by the poorly regulated oil industry that donates huge piles of profits to get officials elected who will "just say no" to any attempt to regulate the oil industry no matter how bad it gets, and we all know which party it is that insists on maintaining the status quo and saying no to all changes Americans voted for in 2008. None of us has read about any Democrats downplaying the environmental damages, or apologizing to BP for our President kicking their asses, or saying that asking BP to pay to clean up the mess they made was a "shakedown" for a "slush fund" like we read about the GOBP doing. "We all agree this catastrophe was caused by the poorly regulated oil industry"
No we don't, and your stance is classic demagoguery. This disaster happened to BP not other companies and studies need to be done to determine if regulations were insufficient or if BP simply transgressed them. I know that taking a thoughtful approach is difficult for those who believe we should never waste a crisis. But look at the results to our economy of that attitude and you have to wonder if a similar lack of focus is not the real problem in the gulf. The pressure on BP to set up an escrow is another example of Obama ignoring our legal processes. We all agree that BP should pay for the damage they've caused. Their wealth, however, is not going anywhere and, even if there was some danger of that, Obama could have requested judicial action. Obama would have done better to seek ways to stop the spill and worry about the blame after that has been accomplished. Obama thinks he doesn't have to have his budget debated and passed by Congress. Thinks he can appoint someone to establish a system of rationing health care without Congressional debate and approval. thinks he can bully private companies to give them his money without a day in court. Socialists often go this way. When they cannot get their way through legal processes, which is always inevitable, they think their cause is so important they are justified in using despotic tactics. Obama's becoming another Hugo Chavez.